New Zealand wine is the success story so far as quality wine goes in the New World. More than any country they have managed to emulate wines from the Burgundy and Bordeaux regions of France, in some regards even beating the French at their own game, due to New Zealand’s warm maritime climate. New Zealand’s success in major wine competitions arises in part from their ability to produce outstanding wines from three grapes: Chardonnay, Pinot Noir and Sauvignon Blanc. Heavy rains and a consistent climate are ideal for growing these grapes, which are synonymous with quality wine. 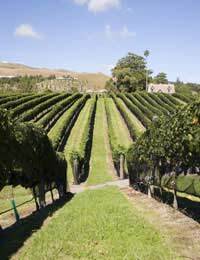 New Zealand has ten principle wine regions, each with varied terrain, and an according variance in produce. This is most notable in the differences in Chardonnay from one region to another, as climate, though consistent within a region, varies considerably from one region to another. New Zealand’s wine growers have demonstrated a commitment to producing wines that emulate the famous French wines. That they have achieved this is tribute to a steady and consistent commitment to quality since the latter part of the 20th Century. In recent years New Zealand Sauvignon Blanc has been held up as the gold standard for this variety. It has a ‘zest’ and crispness previously unimagined, bringing to this wine previously unimagined qualities. New Zealand has also excelled in making Pinot Noir, a notoriously difficult red wine, so temperamental that many Bordeaux vintages are simply not palatable. New Zealand Pinot Noir is often considered on parity with Bordeaux products, and for a fraction of the price. New Zealand Chardonnay is more diverse than the mass marketed Chardonnay made in California and neighbouring Australia. They are characterised by strong citrus and tropical fruit flavours. Being able to grow both Chardonnay and Pinot Noir effectively means that, with the addition of Pinot Meunier, New Zealand wine producers can produce an effective award winning Champagne style wine. New Zealand also excels in the production of the German style Riesling, Gewürztraminer and the noble French grapes, Cabernet Sauvignon and Merlot. New Zealand, as a country that has only been producing high quality wines since the 1970’s, look set to make a growing impact on the world wine stage. The fact that they are not associated with industrially produced cheap wines means that they side step the negative associations made with New World wine production. Additionally, as they remain a relatively unexplored country, New Zealand is in a position to market itself effectively as it steps on to the world scene. They have no association with lager swilling lad-ism, bullish corporatism or corrupt political systems to hold back their projected image. All things considered, New Zealand look set to become quite a phenomenon in world wines. A good supermarket wine to try is Oyster Bay’s 2007 Sauvignon Blanc – a brilliant example of New Zealand’s excellence in this field. Retailing for around £8, sometimes less on reduction, this wine is an easy rival for more expensive quality European wines. Try chilled with smoked Salmon. The wine has an explosive initial taste of citrus, coupled with tropical fruit, followed by a ‘stony’ after taste: Well worth grabbing whilst it’s still on the shelves!